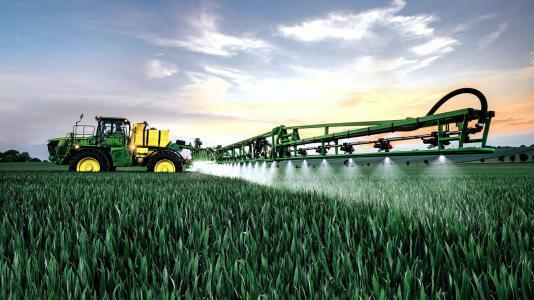 MOLINE, Illinois (April 25, 2018) – Deere & Company (NYSE: DE) plans to construct a new 33,000-square-foot facility at the Iowa State University (ISU) Research Park as a design and test lab for agricultural spraying and applications technology. Wendy Wintersteen, President of Iowa State University, said, “We are thrilled that John Deere continues to recognize Iowa State’s exceptional return on investment. The plans announced today for the ISU Research Park will enhance John Deere’s access to our expertise, research and development opportunities and to ISU’s student workforce. Deere & Company is a world leader in providing advanced products and services and is committed to the success of customers whose work is linked to the land – those who cultivate, harvest, transform, enrich and build upon the land to meet the world’s dramatically increasing need for food, fuel, shelter and infrastructure. Since 1837, John Deere has delivered innovative products of superior quality built on a tradition of integrity. For more information, visit John Deere at its worldwide website at www.JohnDeere.com.